When you think of who fits the traditional profile of a brewer, the first person to come to mind may be a burly, bearded man in flannel shirt and steel-toed boots. What you may be surprised to find out is that women have deep roots in brewing history. In fact, in the early days of brewing, women were the primary brewers. There was even an ancient Sumerian goddess of brewing, named Ninkasi. At Samuel Adams, the legacy of female leadership and brewers also runs deep. 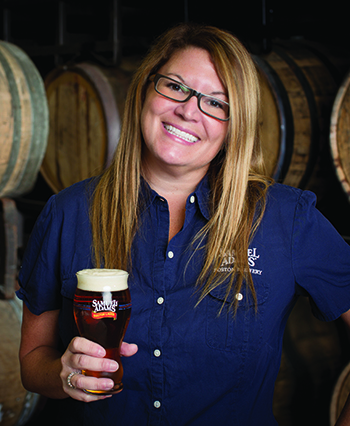 Founder and brewer Jim Koch started Samuel Adams with his business partner, Rhonda Kallman. Fast forward to today, and Sam Adams has retained some of the most talented, pioneering women in the beer industry. Two women at the forefront are brewers Jennifer Glanville and Megan Parisi. That creativity she’s speaking about shines through in some of her personal projects, like her famous Oyster Stout brewed with whole Wellfleet oysters each year for the Wellfleet Oysterfest in Cape Cod. Or her fascination with Sahti, an ancient ale that was historically brewed by women through passed-down recipes, which led to a nationwide limited release of a citrusy Finnish Sahti, recreated by Jennifer and called Norse Legend. It’s this culture of restless innovation and constantly pushing the boundaries that led to the development of the nano brewery in 2012. 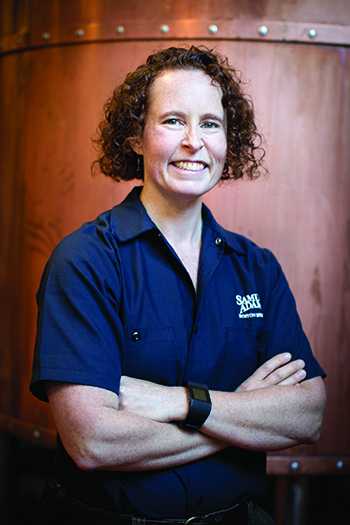 Jennifer was integral in creating the nano brewery at the Samuel Adams Boston Brewery; it acts as a test kitchen and is the starting point of all new Sam Adams innovations. Three years after the nano brewery opened, Sam Adams brewer Megan Parisi came on board to experiment in the space. With more than a decade of brewing experience at Wormtown Brewery and Cambridge Brewing Company, Megan found her home at Sam Adams and has been instrumental in developing beers and perfecting recipes. Take Sam ’76 for example, the newest release from Sam Adams. It underwent more than 60 iterations in the nano to create the perfect combination of flavor and refreshment, with slight tweaks, different hops and new flavors. This is what Megan thrives on. “The creativity, the science, the ability to sit down with other people and enjoy the fruits of your labor,” says Megan, “these are the best parts about being a brewer.” One of Megan’s recent developments, New England IPA, is bringing the popular style to drinkers across the country. The two skilled brewers agree that while the industry has changed significantly over the years, it has only created more opportunities for women. “There’s more awareness now around female brewers, and organizations like Pink Boots Society help to create a community of women in the brewing industry,” says Jennifer Glanville. “I’ve seen more clubs and groups of female craft beer drinkers, which is really incredible. We even have a book club that meets at our taproom for Books & Beers. Though they may not fit the burly, bearded brewer bill, Jennifer and Megan, like many other women, are transforming the industry, beer by beer. They are pursuing their dreams, driving innovation and turning their passions into a career. The good news is that more brewers, male or female, means more beer. So what advice do Jennifer and Megan have for anyone interested in brewing? “Just do it!” We can all raise a pint to that.